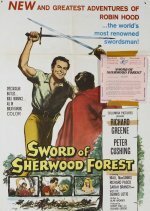 To those of a certain age, Richard Greene was the definitive Robin Hood, ushering in ITV in 1955 in a cleverly cast (though cheaply made) television series with a remarkably catchy theme tune. This is the feature-film spin-off, co-produced by Greene for Hammer Films. Alan Wheatley makes way for Peter Cushing as the villainous Sheriff of Nottingham, and the film is directed by Cushing's old friend and Hammer colleague, Terence Fisher. Technicolor adds some scale, but this is really a cheap and cheerful affair. Look out for a young Oliver Reed.